Bus Pirate firmware v6.1 is now available for download. This version fixes a big bug with the SUMP logic analyzer mode, and includes other small updates for hardware v3 and v4. UART autobaud detect improvements, make the ‘Nearest Common Baud’ function smarter (v4) Thanks Brent! 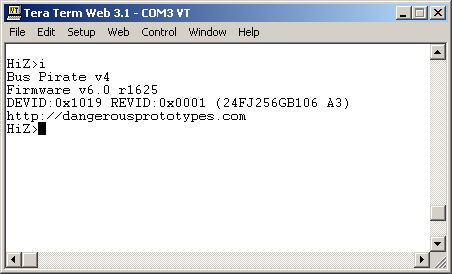 This entry was posted on Wednesday, January 11th, 2012 at 2:00 pm	and is filed under Bus Pirate, firmware. You can follow any responses to this entry through the RSS 2.0 feed. You can skip to the end and leave a response. Pinging is currently not allowed. Successful update on BP4! Had to build loader for Darwin. It installs fine (on a sparkfun BP). Looks like you have forgotten to include extra BPv3 firmware in this version too, Ian. Sorry to say that, but people hate tarbombs. – Alternate “extra” mode firmware (DIO, JTAG, PC Keyboard, etc…) is not available in the .zip. Anything else missing? And where do I find 5.9 if I happen to need one of those? Those were all moved into the -extras firmware. It should be included in the v6.1 archive, probable called -extras-v5.9 because there was no need to update it. Just load it as you would any other Bus Pirate firware. I think the files you are looking for are in the BusPirate.package.v6.1\BPv3-firmware\old-versions folder. Doh! Yes, there it is in the “old-versions” folder. I guess I skipped that because I was thinking about it being the most current firmware for the extra mode and script engine. Thanks for pointing that out. Hey! There’s a minor off-by-one error in the source. Hi even after flashing the extras 5.9 i still have no jtag option in “m”.. Does it matter witch firmware was flashed before i flash the extras? I have a buspirate 3.6 withc atm has bootloader 4 and firmware 6.1. Does anyone have a similar experience.. jtag missing? After you flash 5.9, does it report firmware version 5.9? If it’s still reporting 6.1, then I don’t think it took. However I needed to upgrade to 6.1 for the openocd support. I used the GUI tool to upgrade with a paper clip and the correct firmware all according to the upgrade documentation. However after the upgrade I reset the bus pirate replug the USB and opened a terminal. No longer does the (help) menu appears not entering any key like “I” results in anything. It’s just stuck. I was doing it all from Linux ubuntu 16.04 with mono. That was because I couldn’t get the cli tool running. I compared the ds30 application with windows and there seems to be some settings different by default and I guess also something underneath happens which would corrupt the firmware. Luckily I could still upload firmware to it from windows client and it worked.